Description This Duluth, Georgia hotel has an outdoor pool, free internet access, non-smoking guest rooms and free breakfast. This hotel is also pet friendly. Free hearty breakfast an outdoor pool and complimentary Wi-Fi all help make our guests' stay at the non-smoking La Quinta Inns & Suites - Duluth pleasant and practical. This three-floor 83-room property offers ample free outdoor parking homey rooms and well-equipped fitness rooms with mirrors. You're welcomed each morning to a large airy dining area where you can enjoy a complimentary hot breakfast featuring omelets bacon and many other choices. The outdoor pool comes with a sun deck where you can lounge and relax and the gracious lobby with living room seating area sets the stage for your stay here to be memorable. The hotel also provides a business center with a computer and printer a meeting room with a whiteboard guest laundry facilities and elevators. Pets can stay with you for an additional fee. In addition to Wi-Fi accommodations include wired internet. 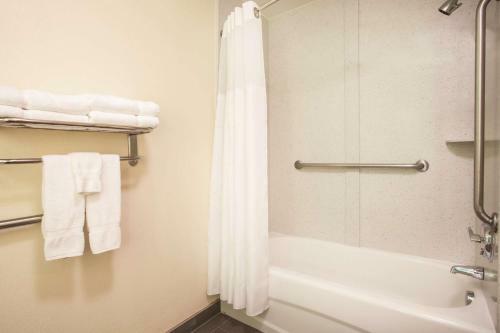 This La Quinta is located 25 miles northeast of downtown Atlanta off I-85 in the upscale suburb of Duluth. It's a half-mile from the Gwinnet Center and Arena and three miles from Gwinnet Place Mall. Other area attractions include Lake Lanier (15 miles) Stone Mountain Park (17 miles) and the Martin Luther King National Historic park in northeast Atlanta (21 miles). Hartsfield-Jackson Atlanta International Airport is 30 miles away. Add La Quinta Inns & Suites - Duluth to your free online travel itinerary.